One of the more awkward Phillies giveaways will happen Tuesday night as 44,000 or so fans make their way home with a Hunter Pence bobblehead doll. That’s right, the Phillies are giving away a bobbler of the now San Francisco Giant to all fans attending the Phightins game against the Cincinnati Reds. Normally the big debate about a bobbler is whether it looks like the player or not (in this case it really doesn't) rather than about if the team should still give it out. But 2012 is different for the Phillies organization. Certainly before the season when the team's promotions department decided to add last season’s trade-deadline hero Hunter Pence to the list of giveaways they didn’t think the 2012 Phillies would fall apart and become sellers at the July 31 deadline including shipping Pence to the Giants. Since the bobblers were already manufactured well before the trade and considering sponsor Liberty Mutual likely forked over a good amount of money for the bobblers giving them away makes sense for the Phils. Just imagine the waste of throwing thousands of bobbleheads away. An saying they are still giving them away just to fill seats wouldn't be entirely true considering Monday night more than 44,000 packed CBP for a promotion as white bread as Dollar Dog Night. For their parts the Phils and Pence both seem happy that the promotion is still happening, according to a statement from Phillies merchandising director Scott Brandreth. Hunter is very appreciative that the Phillies and Liberty Mutual Insurance have chosen to move forward with the promotion, despite him no longer wearing a Phillies uniform. "Thanks, Phillies fans, for the great memories. 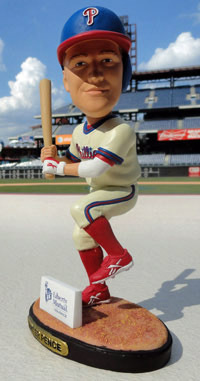 I'm glad my Bobble Figurine will still be given out even though I'm no longer in Philadelphia. I hope it will serve as a lasting reminder of my time there. It was a year of my career that I will never forget." Now fans can have a little collector’s item they can take home with them. And with or without the giveaway the Phillies would likely sell out CBP despite their 57-65 record. And maybe this giveaway of a former Phillies non-great will inspire some future fun giveaways (especially if the Phillies continue to struggle on the field the Phils could use the extra bump). My votes are Steve Jeltz beach towel day, Lance Parrish catcher mask night and the sure-to-be-popular Danny Tartabull Forget-me-nots seed giveaway.